As you may well know, you can borrow USB standard 5 volt dc supply from any smartphone equipped with USB on-the-go (USB OTG) port. USB OTG is a hardware (and software) standard that allows you to connect a device to your smartphone/tablet through the micro USB port. Almost anything that uses a USB connector can be plugged into your Android smartphone/tablet with USB OTG. Presented here is a minuscule aid to do that trickery easily and safely, which can be realized using generally available inexpensive electronic components. Since the circuit is very simple, straightforward, and self-explanatory to a great extent, boring theory part is omitted intentionally in this article. Okay, see the tried and tested circuit diagram of the USB OTG Power Guard given here for the curious hobbyists and makers. 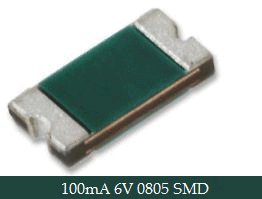 Take note, this design is based on the official information that the maximum current provided on USB 2 OTG port is 500mA (minimum is 8mA when the port is in Host mode), and USB 2.0 specification allows the voltage output from a USB port to be anywhere between 4.40 V – 5.25 V, but it is typically 5.0 V (http://www.usb.org/developers/onthego/otg1_0.pdf). Here, our power guard adapter limits the output current to a safe value of 100mA! Working of the circuit is very simple. In normal state the green ‘power’ indicator lights up and 5V dc supply from the USB-OTG port is available through the USB-A Female port of the power guard adapter. Incase of an overload i.e. when the output current draw exceeds 100mA, the PTC fuse activates to cut off the output supply. The red ‘fuse’ indicator lights up instantly to indicate that overload condition. Since the fuse is self-resettable, just remove the output load/power-cycle the power guard adapter to initiate a valid reset function. Prototype was tested with a ‘100mA 6V 0805 SMD’ fuse bought from eBay. To tell your Android device that your USB OTG Power Guard acts as a host, one pin (ID) of the USB-Male plug is shorted to ground, and this is mandatory here. 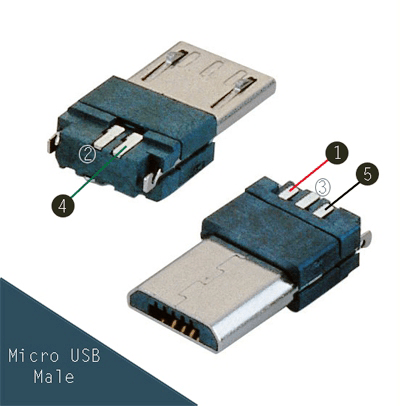 Next figure depicts the pin-out of the standard 5-pin Micro-USB male plug, you need only 3 pins (1-4-5) though.